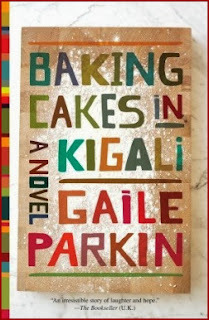 Many thanks to all of the "clever somebodies" who journeyed to Rwanda with our December / January selection of "Baking Cakes in Kigali" by Gaile Parkin. 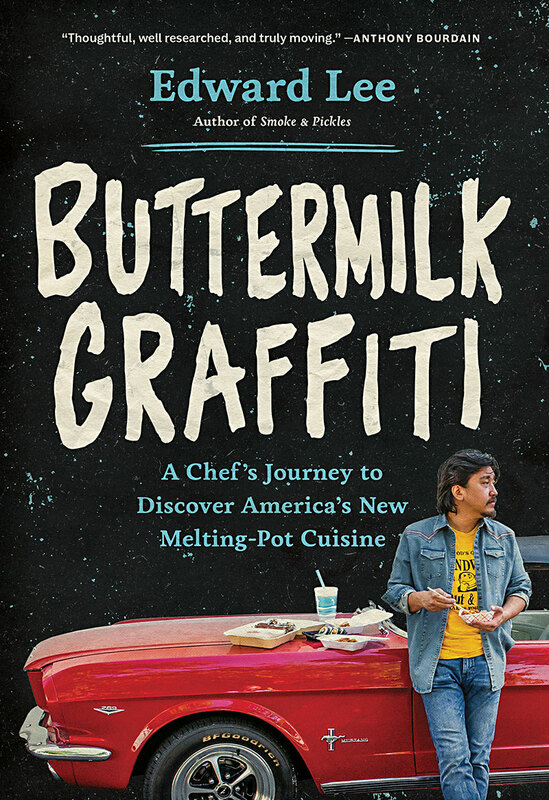 It was fun to read your posts and to see what dishes the book inspired you to make. It seems that were closely divided between the sweet and the savory in this round and whether you were drawn to something sweet from Angel's cake baking business or a hearty dish with African flavors and ingredients, I am sure Angel would be proud and feel even more like a 'professional somebody' since she inspired some truly creative cooking. Since most of Angel's client meetings and talks started with cupcakes or slices of cake, we will start with our sweet treats first and end with the savory (as they say, "life is short--eat dessert first! "), and then I'll introduce you to our terrific and talented guest host for this round, Maggie of Life in a Skillet. My fellow Hawaii blogger, Claudia of Honey From Rock thought that the book "was a wonderful glimpse of life in a distant land and culture, modern-day Rwanda, albeit in a place (University housing) heavily influenced by Western thinking, customs, food, etc., with a resultant struggle by some of the local people to hang on to African traditions." Claudia made two unique cakes for her post--Sticky Lemon Cake and a Blackberry Mochi Cake and speaking like the true foodie she is says, "Delish! It's all about the taste, not the fancy icing and shapes." Camilla of Culinary Creations with Camilla was not a fan of the book feeling, "There was plenty of breadth in the cast of characters, but all of them lacked depth. Even Angel, the protagonist, felt two-dimensional to me. And the food...well, there was a lot of cake and a lot of tea. But there were no real image-evoking descriptions of either." Still, it inspired her to get her 'kitchen elves' to help make a beautiful colorful cake. 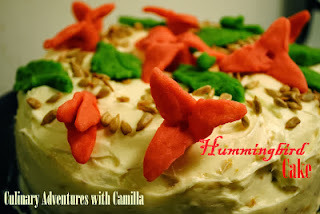 She says, "One of the boys had ordered a slice of Hummingbird Cake somewhere at sometime. Since Angel's cakes were elaborate and brightly-colored, we decided to try making a Hummingbird Cake with red marzipan flowers." 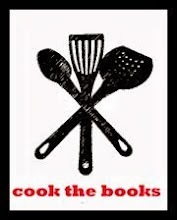 We have a new friend to welcome to Cook the Books, Rossella of Ma che ti sei Mangiato?, (But you've Eaten?) joining us from Italy for the very first time. Naturally, Rossella's post is in Italian so please forgive my reliance on Google Translate here! ;-) If I understand it correctly, the book in Italy is titled "Di Il Profumo Dello Zucchero a Velo" or "The Scent of Powdered Sugar." (LOVE that!) 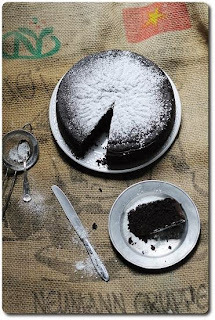 Rosella made a decadent Devil's Food Cake with a big slice for Angel to enjoy with a cup of tea, quoting the line that “When someone is unhappy, tea is like a mother’s embrace.” Welcome Rossella! Debra of Eliot's Eats says about Angel, "Lots of stories and secrets are shared around her table over cups of tea. She becomes a surrogate mother not only to her grandchildren, but also to this eclectic group. Angel has the wit and wisdom to lead her extended family to certain truths, all while polishing her glasses to what must be a sparkling shine." 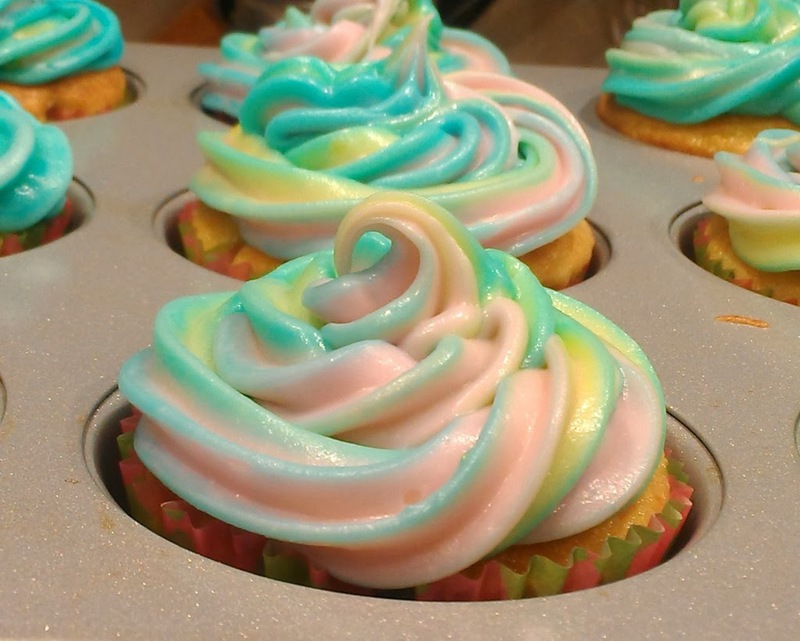 Debra was inspired to bake some wonderfully colorful Citrus Cupcakes with Citrus Cream Cheese Frosting saying, "Because I could never hope to match Angel’s skill in cake making and decorating, I opted for simple cupcakes. I used my basic recipe for citrus cupcakes and frosting and decided to make the frosting as colorful as possible." CTB co-host Simona of Briciole says, "While the reader may not always agree with the way Angel goes about "fixing" the world, it is difficult to be hard on her, given her good intentions. In parallel to her activity on behalf of others, she is also trying to understand and accept what happened to her son and daughter, especially the latter, from whom she was rather estranged before her death." 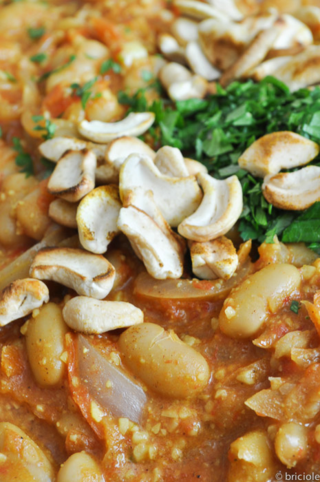 Simona took inspiration from a Gambian recipe and made Beans in Cashew and Tomato Curry, a dish that 'satisfies the palate'. 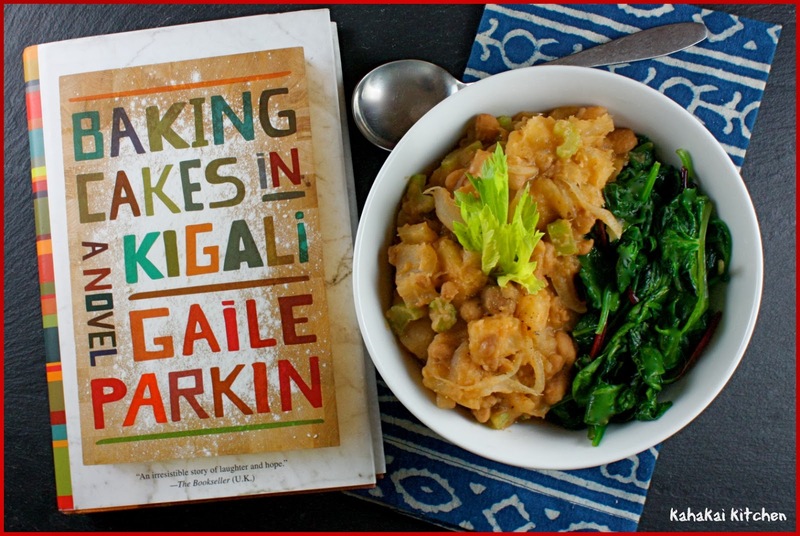 Rachel, The Crispy Cook and fellow Cook the Books host states "Parkin is a native of Zambia and was a counselor in Rwanda for two years after the genocide, so I felt that the subjects she brought up and dialogue rang true throughout the tale. Despite all the heavy content, the tone of the book is largely upbeat and hopeful, though certainly, the world has not taken the mantra "never again" to heart all around the globe, but particularly sad in the nearby Central African Republic." Rachel cooked up some Mchicha, "a Tanzanian spinach and peanut stew, in honor of Angel's homeland" that she served over stewed kidney beans and proclaimed "a very tasty meal to honor this satisfying book." Finally, At Kahakai Kitchen, I was lucky enough to stumble across some cassava root at the farmers market. 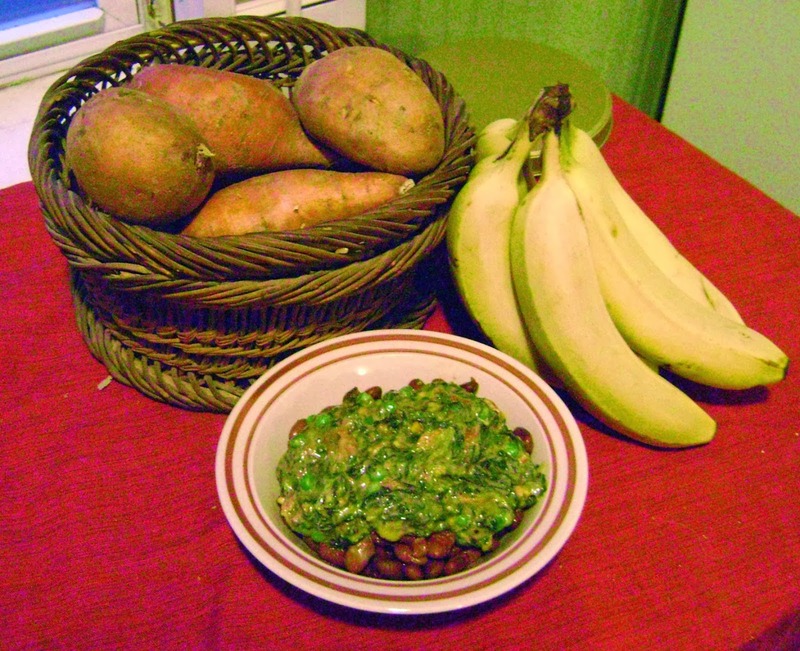 Cassava (primarily the leaves/greens) was mentioned a few times in the book so I did a little research on Rwandan cuisine and came up with a hearty Pinto Bean and Cassava Stew with Greens. I cannot claim that it was an exact replica of a regional dish since I added some additional spices for extra flavor so we will call it 'Rawandanish.' It seemed like something Angela might have cooked for her family and with her generous spirit, kindly shared with the street children hiding in the dumpster in her complex. There you have it--some fantastically-inspired dishes! Thanks to everyone who joined in this round. As usual you all outdid yourselves with your posts and your culinary creations--you won't make it easy for our guest judge. So let's meet the "special somebody" who will be judging this round. 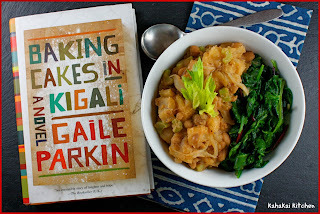 When I couldn't seem to connect with our author Gaile Parkin, I looked for someone who had both a passion for the book and a love for food. Once I read her post capturing the spirit of the book, I knew I definitely found the perfect match in Maggie Daniel Caldwell! Writer and photographer Maggie Daniel Caldwell was pleased to be asked to judge this contest; she is a voracious reader and a big fan of "Baking Cakes in Kigali." 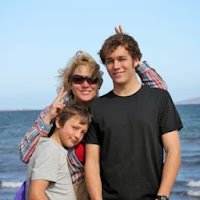 She shares her bite-sized thoughts about food, family, and culture on her blog Life in a Skillet. Maggie lives on the Central Coast of California, where she was inspired to create the coloring book Animalfish Alphabet. You can see her photos of the area at http://project365.lifeinaskillet.com. Many thanks to Maggie for taking the time to review our posts and pick a favorite! I'll be back soon with the announcement of our 'winner'. Until then, you can get started on our February/March selection: Twain's Feast: Searching for America's Lost Foods in the Footsteps of Samuel Clemens by Andrew Beahrs, hosted by Simona of briciole.